The record college enrollment level of young Hispanics is in large measure due to the educational strides they have made, not just growth in the underlying population. 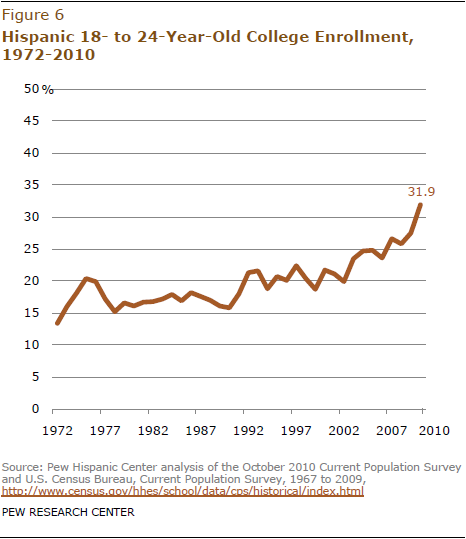 In October 2010, a record 32% of Hispanic 18- to 24-year-olds were enrolled in college (up from the previous high of 27.5% in 2009). In October 2010, there were about 5.7 million Hispanic 18- to 24-year-olds, and some 1.8 million of them were pursuing college. However, if young Hispanics enrolled in college at the rate they did 25 years ago (17% in 1985), fewer than 1.0 million of them would be pursuing college degrees today. In addition to strides in college eligibility, Hispanic youth have increased the rate at which those eligible for college (that is, high school completers) enroll in college. In October 2010, a record 44% of young Hispanic high school completers were enrolled in college, up nearly 5 percentage points from the rate in October 2009 (39%). 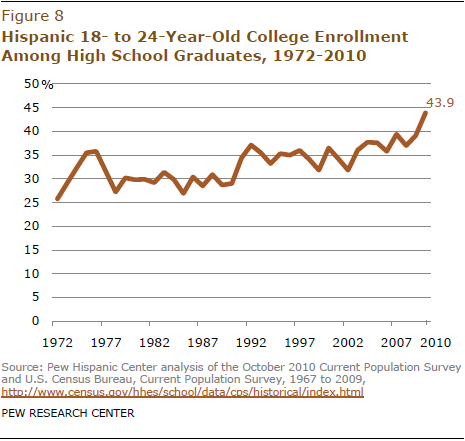 Hispanic population growth is also a factor in booming young Hispanic college enrollments. For example, since 2000, the Hispanic 18- to 24-year-old population has grown by nearly 1.6 million, according to the CPS. (The entire non-Hispanic college-age population grew by only 1.5 million since 2000.) Absent educational changes, Hispanic population growth alone would boost Hispanic college enrollment. But the growth rates since 2000 in various young Hispanic groups demonstrate that population growth alone does not account for the growth in Hispanic college enrollment. The Hispanic 18-to 24-year-old population grew 38% since 2000. The number of 18- to 24-year-old Hispanic high school completers grew 68% since 2000. And the size of the young Hispanic college student population has more than doubled since 2000.